This meme from It’s Always Sunny in Philadelphia always cracks me up when I see it. 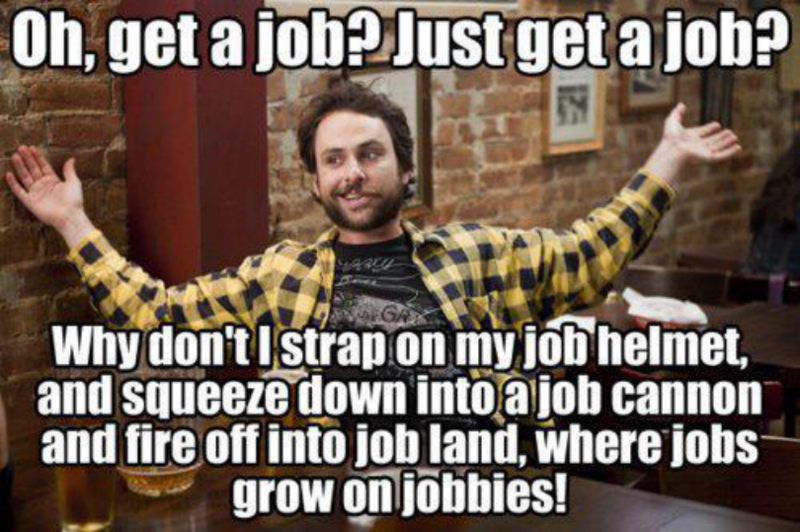 But unemployment isn’t a joke, especially if you have struggled with it for a long time. Maybe it’s time to reevaluate yourself. Check out this list of reasons you may still be unemployed and determine whether or not you might need to change. 1. You’re Overqualified. Or Under Qualified. It’s a tough place to be—looking for a new job with years of experience, as many organizations seek out fresh talent. But really, organizations are looking for expertise as well. Don’t low-ball yourself. Employers will be annoyed if you’re applying to entry-level positions or perceive you as desperate. Keep trying for the types of positions your experience and education fits. It can be challenging when an employer may be searching for something so specific, but you’ve got to be honest with yourself and try. Just the same, don’t apply to a job that you clearly don’t fit. Read the description. If you don’t meet at least some of the qualifications or experience desired, the employer won’t take you seriously. You know that AgCareers.com is behind this blog, so you know that we love to help job seekers out by giving expert career and job search advice. But the best piece of advice we can give you is to search for jobs on AgCareers.com. 1. Use the search bar at the top of the page. Super simple. Type in any keywords that have to do with what you’re looking for: Swine, Accounting, Cotton, Graphic Design, Tractors, Education, anything. 2. Search by Location. You can search for jobs by location using the aforementioned box at the top of the homepage where it is labeled “Job Location.” Or you can use the snazzy interactive map that you’ll see on the homepage as well. Click on whichever country, region and/or state you’re interested in to view a list of open positions in that area. Should you add your resume to an online database? You may be using online job boards like AgCareers.com to search for jobs and apply, but you should also take advantage of other tools offered to showcase your resume. Resume databases allow you to market yourself to potential employers. 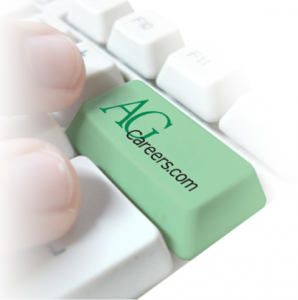 The AgCareers.com Resume Database is free for candidates. Employers conduct thousands of resume searches EACH month. By posting your resume in the database, your next career might find you. Who should post their resume? Workers that will be displaced due to downsizing, lay-offs, etc. Resumes in the AgCareers.com database are not shared with anyone outside of the employers that have access to it. If you are currently employed in the agriculture, food, natural resources or biotechnology industries and do not want your current employer to find out you are exploring other opportunities, you may not want to post your resume in the database. 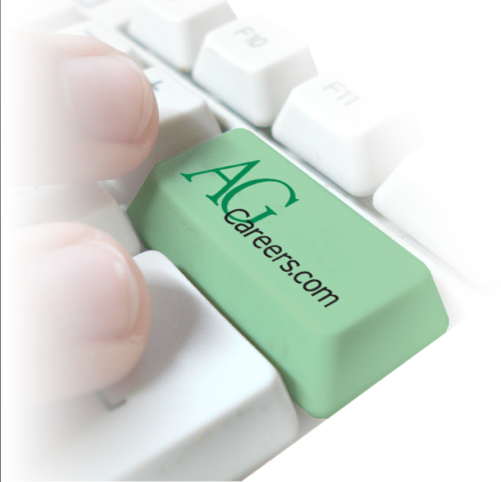 Welcome to the AgCareers.com Career Cultivation Blog! If you’re reading this, it’s safe to assume that you’re searching for career advice. More specific? Career advice in the agricultural industry. What a winner you have picked. 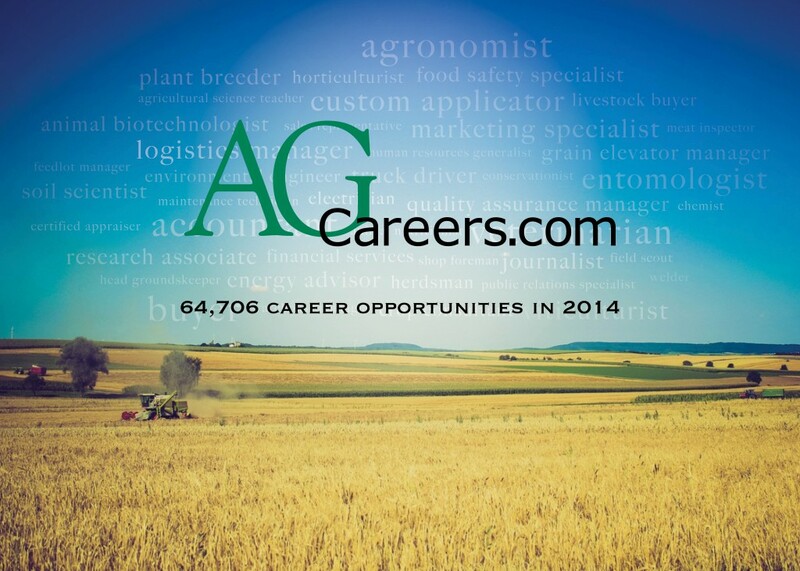 More than 64,700 various, fulfilling job openings are posted last year within the agricultural, food, biotechnology and natural resources industries on AgCareers.com. And you’ve come to the right place for ag career advice. Welcome to AgCareers.com’s Career Cultivation Blog – a blog written completely for job seekers in the agriculture and food industries.